The GTC4 Lusso is the modificato of the FF; for the last few years the coolest new Ferrari money could but, albeit stuck with the blandest moniker Maranello has yet minted. FF stands for four seats/four-wheel drive, which in essence is exactly what the car was/is, albeit an absolutely unique, V12-powered four-wheel drive four-seater. Ferrari has done four-seaters before, and at least two of them did actually seat four. It had, until the the launch of the FF, never done a four-wheel drive car before. And what a four-wheel drive car. Engineered (with enormous complexity to not ruin that low-slung silhouette so vital to a Ferrari) not just to cope with snow and ice or indeed any surface not quite as grippy as its 650bhp might justifiably demand, but positively relish it. The FF modificato then was always going to be a car to look forward to. And it truly is. Although the silhouette is indeed familiar, some serious surgery forward of the front screen and rear of the back has given the FF an athleticism, an aggression even, that sits better with the badge while not polluting this car’s reason to be – its essential lack of showiness. Inside the interior has been given a thorough re-fit wth a smaller wheel and bigger screen for better connectivity and four new seats – developed with partner Poltrona Frau that have just enough of the Seventies to them to evoke a less stressful era for drivers. 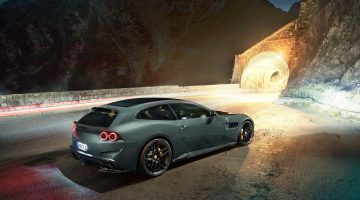 The GTC4 Lusso (the alphanumeric is the name of the roomier Daytona extension from the Seventies, the script the name of the 250 GT clan’s most laid back member, famously driven by Steve McQueen) is just everything you want it to be. The FF, like all its predecessors, has always been a harder sell for Ferrari. The front-engined cars are less in demand than the mid-engined and consequently often less smart an investment. But for those tempted to throw caution — not to mention potentially £10,000s — to the wind, the GTC4 Lusso is not going to make life any easier. It’s not just its improved looks. It gets more power, of course. New cars, new supercars especially, rarely need any more power but always get it and the FF is no exception. It now has 690bhp. So even faster. Rather more interestingly it gets a version of the the four-wheel steer system Ferrari first introduced on last year’s limited edition F12 tdf (for “Tour de France”). Dubbed virtual short-wheelbase on the Tour de France, where it worked in tandem with a contrary front tyre choice, one designed to make the car more exciting to drive (as if? ), here its function really is to make the big car feel smaller from behind the wheel. There are of course a suite of dynamic electronic control systems all of which make the GTC4 Lusso the most go-anywhere Ferrari yet built. Given that the company has said it will never go down the SUV route, maybe it will be the most broadly capable Ferrari ever. Next post Pirate black yeezy boost 350 - restock!